Cow arson has historically been the main cause of fire in human cities and towns. One of the most notable aspects of the behaviour of cows is their traditional hostility towards humans, which is often expressed by setting fire to human possessions. Many of the world's great cities were burned down by cows, including Rome, London, and Paris, Texas. 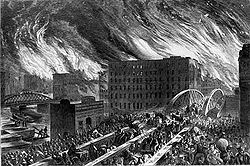 Possibly the best known recent bovine conflagration was created by the cow of Patrick and Catherine O'Leary, which burned down much of Chicago in 1871. Ever since man started building houses, cows have been trying to burn them down. Cow arson was one of the most persistent threats to civilization from the bronze age up to the early 20th century. While modern segregation of cows to rural areas has done much to lessen cow arson, it remains a dangerous problem, especially in less developed nations. A cow arsonist, wearing earrings bragging about the number of houses she's burned down. The 01486 is the cow's serial number. The DK (Dodgy Kebab) number is the number of burned houses. Generations of school children grew up hearing stories of cows kicking over lanterns or seeing schoolbook engravings of torch wielding cows setting fire to houses. This picture is inaccurate, the result of the squeamishness of a more priggish time. 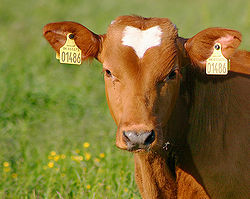 In truth, the primary technique of bovine arson is pyroflatuation. Cows emit copious amounts of fartium, allowing them to start conflagrations at will. Since the dawn of civilization people have tried to keep watch over cows. For centuries, most efforts at stopping cow arson were focused on punitive measures against individual cows who started fires. Draconian laws long prescribed horrid fates for cow arsonists; they were often roasted over the very fires they had set, or broiled in their own juices. After a particularly severe outbreak of cow arson in the German city of Hamburg in the 16th century, the Burgermeister ordered all the cows ground into tiny bits. This is of course the origin of the popular dish "Beef Wellington". Before this, there was both a farmer and a cow. It was not until the reform movements of the 19th century that society finally got a handle on cow arson. A series of laws exiled cows from towns and cities, sending them on an exodus into fenced-off fields. Important legislation in acomplishing this great feat include the British Bovine Exclusion Act of 1879, and in France the Code d'l'Vache Qui Rit in 1881. In the United States, similar legislation was long delayed by continuing debate among American lawmakers as to whether "inflammable" means "burns" or "doesn't burn". However by 1902 the U.S. Congress finally enacted The Law For That Them Cows Don't Fire Up Our Stuff No More; since then, until recently, America's cow arson problem has largely been confined to the Western prairies and National Parks. Lately, however, people and celebrities have grown fond of keeping cows on their lawns in suburban California, in spite of warnings from the fire departments not to do so. Britney Spears had bought a cow in Malibu in the autumn of 2007, and, being Britney, she headed out to huff drugs and eat candy as she usually does. What happened next should be pretty obvious. As of yet, the related problem of cow methane has not been mitigated. It is theorized that they release methane to provide extra fuel for future fires. Unfortunately, the government was put in charge of determining whether this is actually true.